3 months ago … it's about time I finally blogged about it! My entire pregnancy, I was mentally preparing myself to still be pregnant beyond my due date (August 8). 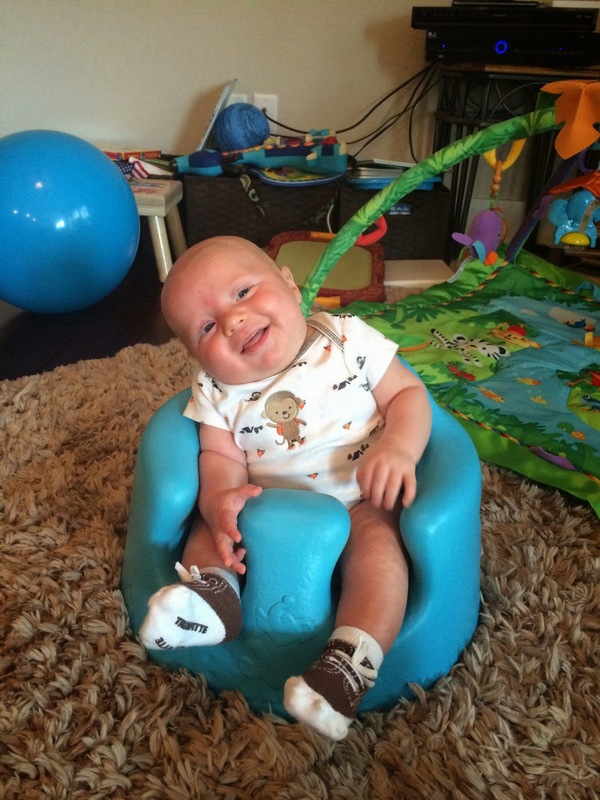 Landon was born 11 days after his due date, and those last few weeks took some mental toughness! So when I woke up around 7:00 in the morning on Friday August 1 and my water broke while I was getting out of bed, I was pretty surprised that it was go-time already! There was no "pop" or massive flooding of water, but there was no doubt in my mind that my water had broke. Unfortunately, I wasn't having regular contractions, so I knew I needed to try and get things moving along. (If your water breaks and you head right to the hospital, they'll basically put you on a 24-hour clock, and I wanted everything to be as intervention free as possible). I texted our doula to let her know what was going on and get some suggestions to get labor going. Then I took a shower, used some clary sage oil, went for a walk, and did some exercises to try and get baby in the right position. My mom came and picked up Landon in the late morning. At noon, I went to the chiropractor to get adjusted, then Justin and I stopped at Whole Foods to pick up some lunch. Pretty mellow, low key morning. I laid down in bed when we got home. I knew that if things didn't pick up on their own by mid-afternoon, we would need to head to the hospital anyway, so I kept hoping and praying the contractions would get more painful. Around 2:00, contractions were getting stronger, and by 2:30 I was fairly sure things were now moving along. I was still getting things packed for the hospital, but had to take breaks during contractions and breathe deeply or get on my hands and knees. I quickly went from wishing things would get more painful ("that kinda hurt a little, maybe things are picking up") to wishing they were less painful ("oh yeah, $@&%, that's what labor feels like!"). Justin could tell things were progressing quickly and was anxious to get to the hospital. I couldn't get comfortable at this point, and after about 10 minutes of attempting to put my shoes on, Justin convinced me to just go with sandals and get in the car. We headed to the hospital a little before 4:00. Arriving fashionably in my sandals with socks, we were checked into the hospital at 4:30. I spent a few minutes in the bathroom putting the hospital gown on, then very quickly wanted it off … wearing any clothes was SO uncomfortable. Probably because we were meant to give birth naked, right?? The nurse checked me and I was dilated to 6 cm. 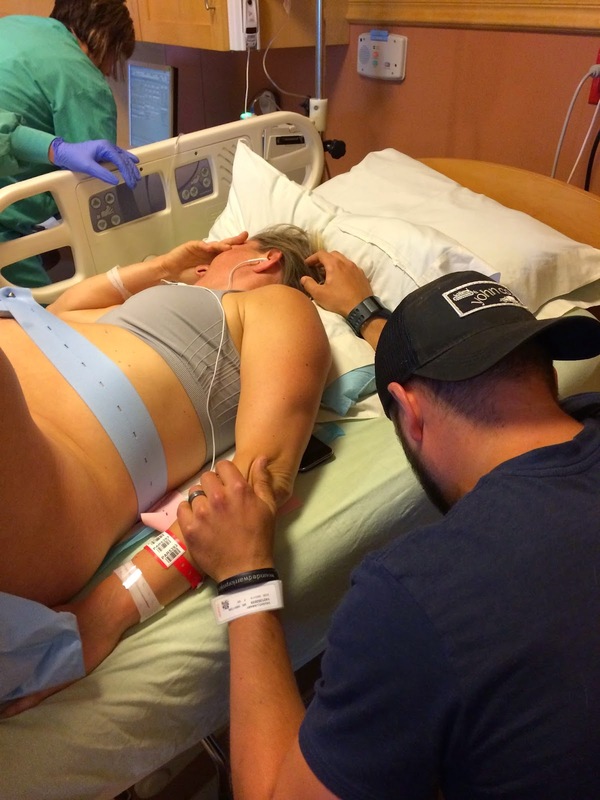 I was laying on my side in bed trying to breathe and relax while lots of nurses were coming in and out… the contractions were very intense at this point but I heard some of what was going on (my doctor wasn't at the hospital, was on her way ... Baby's heart tones were low ... No doctor was at the hospital). The nurse checked me again and I was 8 cm. I started feeling like I needed to push (actually, my body just started pushing … it's basically an involuntary reflex). The nurses were telling me to try and breathe through it and not push because the doctor wasn't there yet. (FYI, trying to stop your body from pushing when it wants to push is impossible! I tried, then I threw up a little in my mouth, so that was fun). The next contraction, the nurse was again telling me not to push and I said "no, I'm pushing". The nurses then jumped into action realizing baby and I weren't going to wait for the doctor (plus it was best to get baby out asap because of the low heart rate). 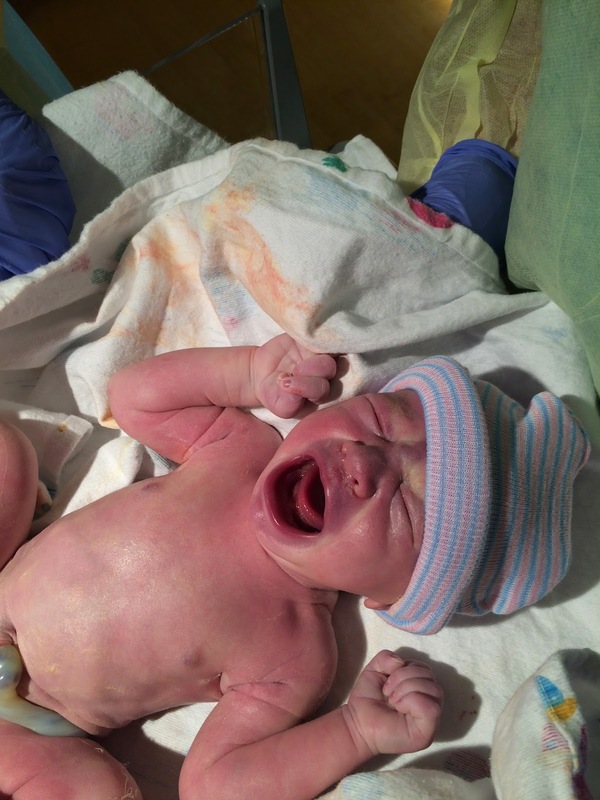 After just a couple pushes, Carter popped right out at 4:55 … just 25 minutes after we checked into the hospital! The cord was wrapped tightly around his neck (hence the low heart tones) so they rushed him to the warmer He was perfect though so within about 10-15 minutes he was on my chest. My doctor arrived a few minutes after he was born. I was up and moving within an hour. It all happened so fast, there wasn't much time to get too exhausted, and I kept thinking it was weird how normal I felt almost immediately after. 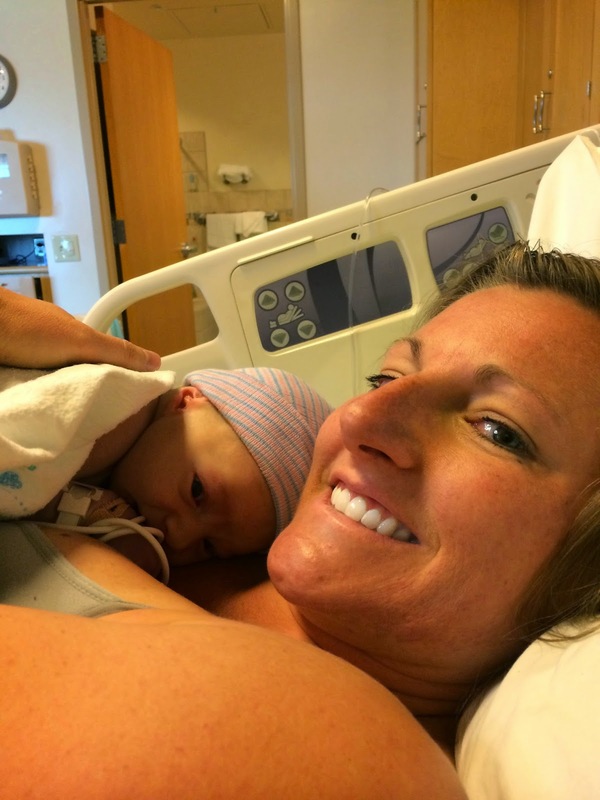 It was such a completely different experience than when Landon was born! We had lots of visitors that night. Carter got to meet all of his grandparents, aunts and uncles, and of course big brother Landon. Landon was not too stoked about the new addition to our family. We had been talking about the baby's looming arrival, and I wasn't sure how much he actually understood about what was going to happen. 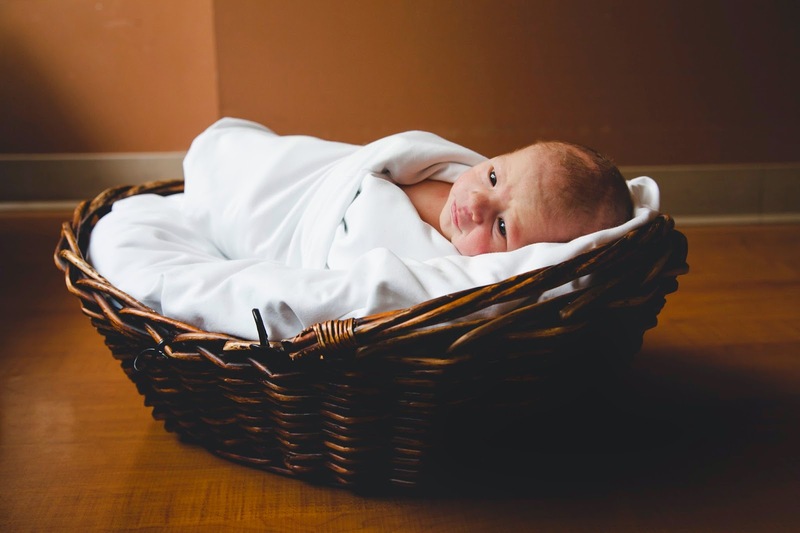 When he came in the hospital room and saw me holding Baby Carter, it wasn't exactly the reaction we were hoping for (i.e. head in his hands crying … complete devastation). 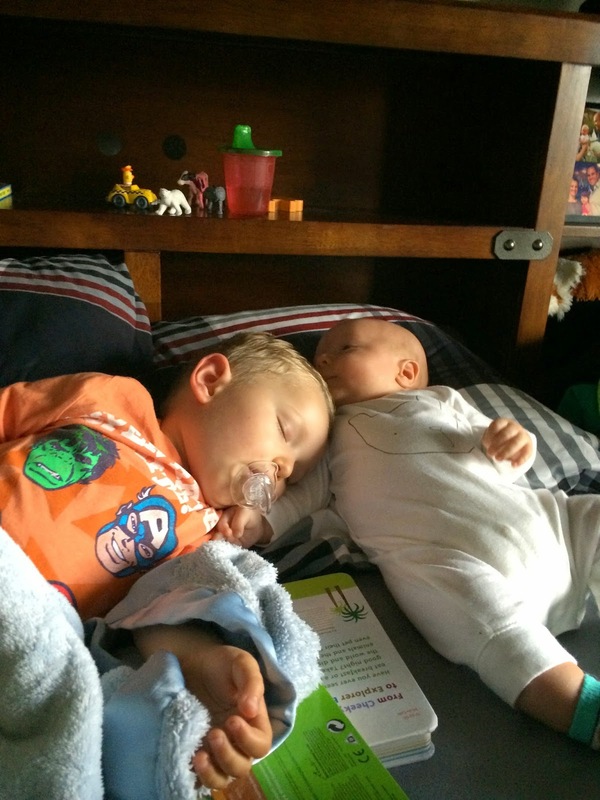 Landon has since warmed up to Baby Carter. After a couple weeks of him ignoring the tiny little human I had been holding 24/7, I was in the garage calling for Landon to come get in the car while Carter was in his carseat on the kitchen floor. Landon came to the door, then got a concerned look on his face and ran back in the kitchen. 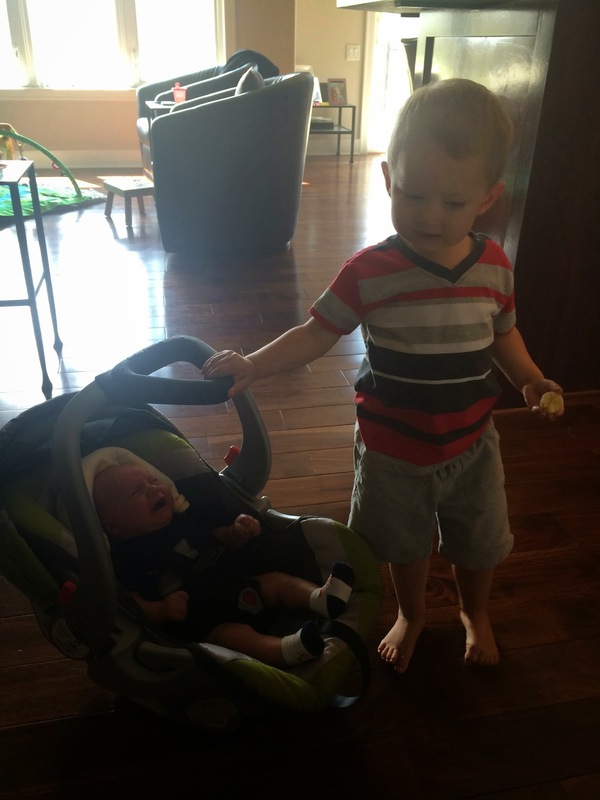 I walked in the house and found Landon holding the carseat handle … "Baby Carter?" He's still not a lovey-dovey big brother, but he at least gets concerned that Mommy is going to forget Baby Carter (which gives me a lot of confidence in what my toddler thinks of my parenting skills). 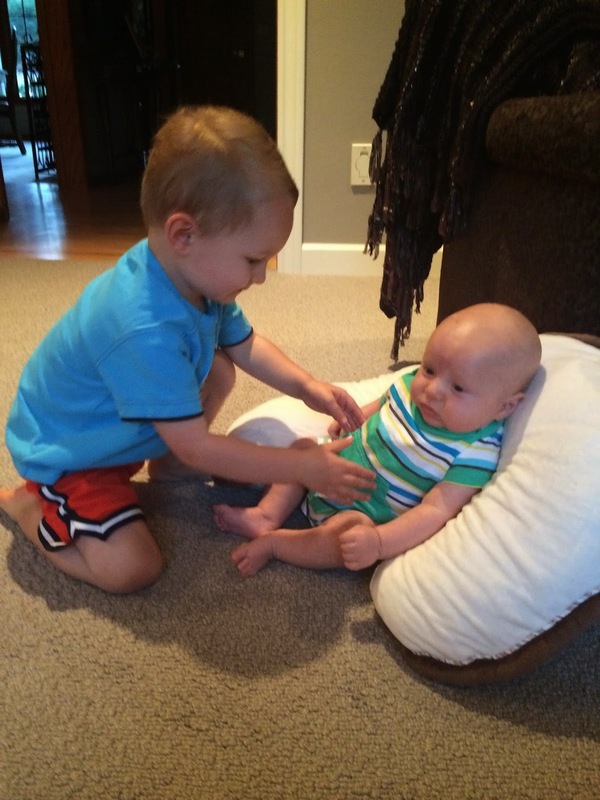 I can't wait until they can interact more with each other and become little buddies. just trying to move Carter so he can sit there.